I giggled for quite a while when I saw this sign- maybe because Hubby had spent so much time telling me about the lengths he and his friends would go to in order to sneak booze into cricket matches. Or maybe because I'm really immature. 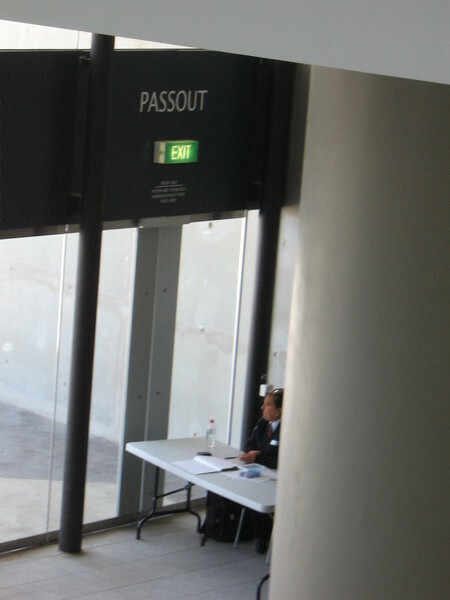 I admit I don't even really get what the sign is trying to say... is that the way the Exit is marked or something? I'm assuming it doesn't actually mean "pass out here" or "please pass out before entering". This is my home turf - I worked at the MCG (in the corporate boxes)for years while I was a University Student. It's the home of not only our Cricket, but our Australian Rules Football. Melbourne is sports mad - the MCG is a pretty important cultural landmark (actually - for any cricketing nation, it's quite a landmark). Cricket matches are really long - a test match goes for days. A Pass Out is a pass you are given if you want to leave the ground, but still want to return later that day. You can't get them at any exit. @Claire- thanks for the explanation. None of the Kiwis I was with knew that. Maybe they have a different term in NZ. The poor guy giving us a tour didn't really know what to do with me- an American with no real interest in cricket (I've picked up rugby as a spectator sport since meeting Hubby, but cricket still eludes me). I told him he shouldn't worry- I was there to make Hubby happy. So funny, I've picked up cricket as a spectator sport since meeting my husband. I already liked baseball, so it wasn't a stretch. But I actually like cricket even more. What helped my figure out the game was watching 'highlights', where they compress a 5 day match to one hour. Bill Bryson also has a hilarious description in his book In a Sunburned Country- something about mattresses strapped to legs and gloves of the kind used to handle radioactive material. The best form of cricket as an introduction is called Twenty20. It's a limited overs game - each team plays 20 overs and the whole game only lasts 3 hours (compared to the 8 hours for a one dayer & up to 5 days for a Test match!). I quite enjoy the games - it's all about the big hits! Here in Australia the Twenty20 series is called 'the Big Bash'. I'm looking forward to getting along a few matches this summer. Last year I was 9 months pregnant and NOT coping with the heat... This year it'll be beers and enjoying a hot summer evening. Yeah. Summer!